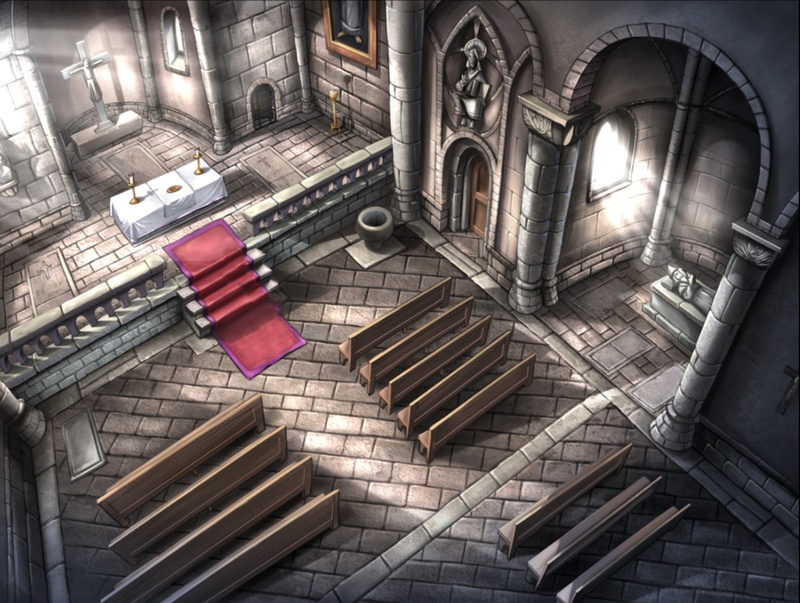 Murder In The Abbey (aka The Abbey in Europe) proves to be a delightful, pleasantly surprising medieval mystery featuring colorful graphics, stiring music and excellent voice acting. Only a few rough edges and some discordancy between cartoonish visuals and serious storyline keep it from our coveted Gold Star. In a marvelous opening scene you, as Leonardo, accompanied by 13 year old Bruno are wending your way to “one of the most eminent and enigmatic abbeys in the kingdom.” Leonardo has quite a reputation. As a former Grand Inquisitor, he is viewed as being mature and wise in the ways of the Church. Bruno, a neophyte, is on his way to join the monastary. 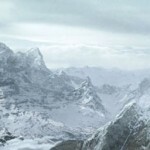 There have been some strange goings-on, amplified by a near death experience on the way up the mountain. Thank goodness the death Leonardo has been asked to look into doesn’t include his own! 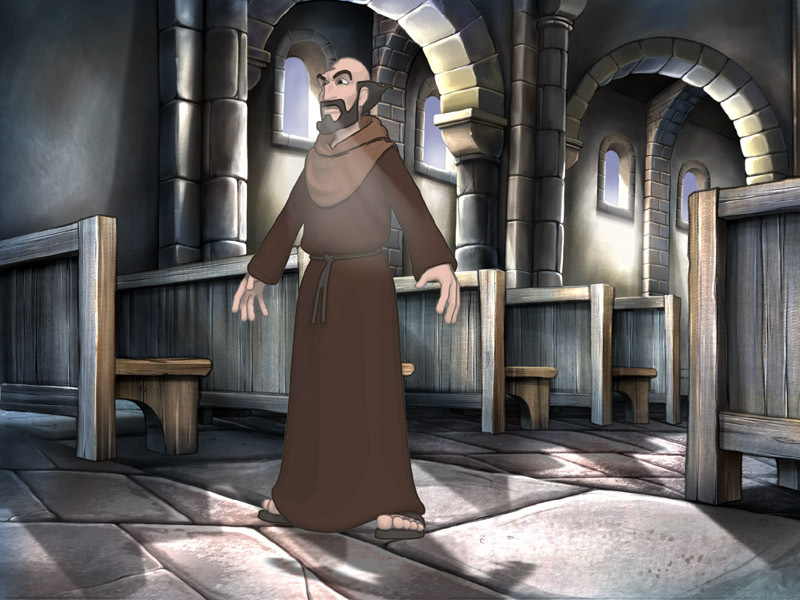 Playing from a 3rd person POV The Abbey presents Leonardo and his sidekick in very clear and colorful fashion, using vibrant 2D settings and cartoony 3D characterizations. My eight year old grandson saw me playing and commented that he was sure he’s seen those robbed figures on Saturday morning T.V.! From the fine included printed manual to the excellent graphics, The Abbey is a thoughtfully and professionally accomplished game. One might argue the cartoony approach to such a serious and involved crime setting, but this approach quickly fades as a concern. Further, not only is the voice acting excellent, with Leonardo sounding Holmes-like with his delivery, but the accompanying sound effects and musical score complete a very involving experience. In terms of gameplay mechanics, we have an entirely mouse-driven game, with all actions logically available – eg., traveling within a map, selecting and moving through conversations, adding to inventory, looking at conversational log. Although puzzles are sparse and rather simplified, Murder In The Abbey still presents a fine detective-adventure in an unusual setting. You’ll spend 20 hours in 20 locations, and have a good time doing it. The lead character, Leonardo, is one with whom you’ll identify as a slueth. You’ll enjoy his probing and commentary. The script of this European developed game has been nicely translated. Perhaps the only gripe I might have would be regarding the biggest chance the developers took – using cartoon graphics for a most serious story. Yet, one gets past that. For an involving journey into a claustrophic medieval setting filled with intrigue and surprise, Murder In The Abbey is should be high on your adventure gaming list this Holiday Season. Minimum Specs (for PC): Windows XP/Vista; 1.4 Ghz; 512 RAM; 64MB Video Card; 3 GB HD space. This is a fair review. I would only like to add that if you should know “The Name of the Rose” then the game story is very different and you will be disappointed if you expect the book story and characters.